It took imagination to come up with the idea of Wonder Woman though having said that, it didn’t take much imagination to find the right actress for the part in the original TV series. 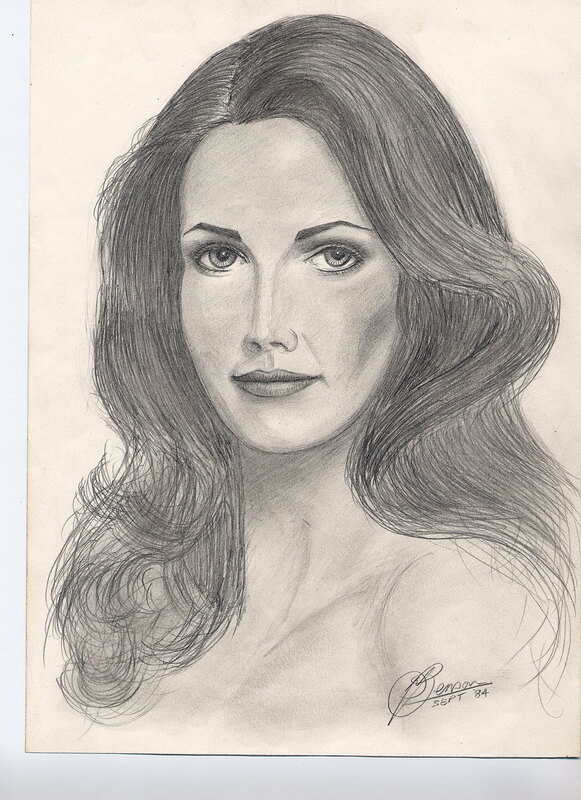 That lady was Lynda Carter. I did the accompanying drawing in 1984. On the subject of exercising the imagination, Lynda wore a fetching patriotic costume. It was the sort of outfit that made me wonder if Catherine Bach’s Daisy Duke outfit was loosely, or tightly based on the original. I digress. I always wondered what Lynda would look like without the starts and stripes … so I stopped drawing just below the shoulders. As I beat the keys into submission with my efforts on Chapter 2 of my novel I occasionally take a break by writing poetry. I’ve always professed to writing to suit all tastes since starting to write verse about three and a half years ago and I wanted to do something different. Whilst thinking outside the box I realised I’d never written fantasy. It was as I was listening to music and editing the photos in my screen saver that inspiration struck. ‘Crystabel and Elf’ the mini-series was born. Like all my mini-series the first episode is written without much idea about where the character or characters will go but a plot usually builds by the second or third. This one has been no different and I find myself now working on ‘Crystabel and Elf – Part 4’. There will be a lot of folk out there who probably don’t realise that these diminutive creatures that live in woodland etc, etc, have emotions and desires … enough. Hang on … shouldn’t that be fairy nuff? I caught sight of a particular lady and imagined her as a fairy … okay bear with me on this … I wrote rapidly for a few minutes to make the idea a reality … as writers do, then I wrote the first episode. Romance is already in the air, amongst other places and I can already sense the desire to bring in a bit of adventure and heroics. Did I mention the elf is originally from north of the border? No, well he is! If perchance you find yourself following the links to read about these little people feel free to leave a comment when the option is there. My plots are sometimes comment driven so if a good idea is suggested I’ll run with it. Okay, back to reality. Thank you for reading this and I hope you find something else of interest on my links. When I commence a story I can write happily for a while without any literary references or quick checks with Wikipedia. In my latest competition entry I am not afforded the luxury of either of these things. The Global Writers competition for December is themed on ‘surreal’ so my tale so far is fantasy/science fiction/adventure with some dialogue thrown in for good measure. Word count will be a secondary consideration for me on this one because my concentration at the moment is satisfactory telling of the story. I’m not a big fan of fantasy or science fiction when it comes to reading and I don’t want to know what other entries are about because I want to attempt this without outside influence. We’ll see how it goes soon enough because I only have so many more days to edit before I end up with the final draft. Merry Christmas to anyone who happens by.